Download Resetter Printer Canon ip2770 - This tutorial will discuss how to fix the error on the printer Canon Pixma ip2700. This condition is characterized by the appearance of an error message on the screen that states " The Ink Absorber is Full ". Although this method does not explain the details of how to clean the ink disposal tank but at least this method is very helpful in an emergency. Then release the Stop / Reset button and press 5 times, wait for about 2 second. This will cause the printer to enter the Service Mode state. On the LCD panel led will blink briefly then flash green. On the desktop would appear that windows detects new hardware, it's not a problem just ignore it. Run Resetter Canon ip2770. Download on Resetter Canon ip2770 or in the link at the bottom of this page. You should prepare two sheets of paper in the paper tray of the printer. In the "Clear Ink Counter" section click "MAIN" then the printer will print one page like picture below. 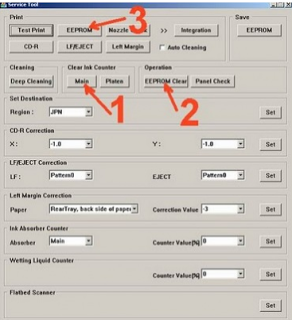 Then click "EPROM Clear" and printer will print one page contains many lines of code.